Let’s say that you have some music education and/or experience and you want to find a way to monetize it. This is not an uncommon position to be in, especially among music students who believed the world is their oyster only to find themselves in a highly competitive industry where even the big ones complain about the royalties they get. Do you want to know the best ways to make money doing music? make money by doing music-related jobs. try to “make it,” but that might be much different than you think. Still not sure how your music talent could serve as a money-making tool? Let’s dive a bit deeper into the type of jobs you can do and revenue streams you can set up. How to Make Money Performing Music? This surely applies to musicians. As a player who doesn’t have a band, your major sources of income could be from session work or as a stand-in. Session work means that people will hire you to play with them, either in the studio or for live gigs. As a stand-in, your job is to step into someone else’s place, usually on short notice. Besides having the chops, these opportunities will require you to have a good network of fellow musicians. To be even more employable as a session musician or a stand-in, consider learning to play more instruments than one. Even sticking within the same family of instruments will make you more in-demand. If you have a band, you can make money gigging at bars and clubs. This, however, isn’t the most lucrative thing you can do because these gigs don’t necessarily pay well. You may even have to play for free. Playing at events is an altogether different deal. And having a wedding band, well that’s where the good money lies, especially when compared to bar gigs that pay less than $100 plus a free drink. Or maybe just the free drink. Did you know that karaoke hosts are called KJs? Did you know there is such a thing as a karaoke host? Well, there is, and you can be one. Your job is basically to bring people through the door on karaoke evenings and do your part in keeping the good times rolling. Or, you can just be a DJ, in the sense that you can play music at parties, Bar Mitzvahs, or other types of events. The best ways to make money doing music-related gigs is to teach. Whether you know how to play an instrument, or you know a specific aspect of music like composition or music history, there is always someone who will need to learn it. Again, you’ll need to know a thing or two about advertising to help your private tutoring business take off. And if all that marketing thing really appeals to you, why not start a YouTube channel about music? It’s already a pretty crowded place. So is every other place when it comes to musicians. There’s always too many people fighting around too little money. And speaking about people fighting for money, if you can become a songwriter and a good one, you can start making good bucks. As a songwriter of a hit song, you can earn more in royalties than the person who performs the song, or the musicians who played it. This is one of the reasons “making it” isn’t as glamorous as it seems, because the money is split in some very strange ways. And songwriters have it really good. So there you have it. If you want to perform, you will probably earn the best money by doing weddings, unless you score a gig in a pop star’s backing band. If you want to use your musical talents in a different way, the best way to earn big bucks is to write hit songs like Max Martin does, and that’s easier said than done. But at least now you can figure out where to set your aims. 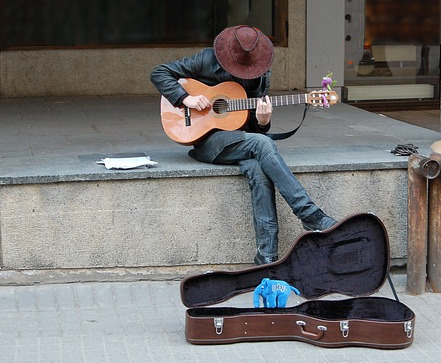 Posted in Songwriting Basics and tagged busking, earn money making music, make money, Music Income, performance. Bookmark the permalink. RSS feed for this post. Trackbacks are closed. Interesting article. I believe teaching music is quite a good idea. As a writer, I also teach students to write high-quality papers. Except that, I work as a freelance writer and hope to publish my own book. So I agree it works if you try to be multitasking in your business area. 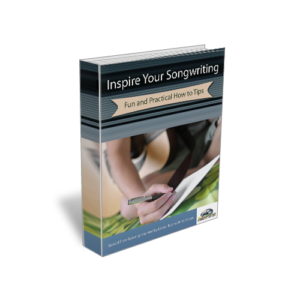 It’s easy to get carried away in the songwriting process and ultimately forget what the song was originally about. When you write, try and envision a scene or moment that you are trying to capture. Think about the emotions that you want to portray. Use several themes rather than one. For example, ‘bittersweet’ or ‘calm and happy’ are both better than just ‘happy.’ Once you have a scene in mind, write specifically to build that scene. Don’t go off on tangents and write about other emotions that may be contradicting to the ones you’ve chosen. For example, if you’re writing an upbeat song about love, it’s probably unwise to toss in a sad verse that contradicts the overall mood and flow of the song.